Skulls And Kisses | UK Lifestyle and Alternative Fashion Blog. : Paris In 3 Hours. 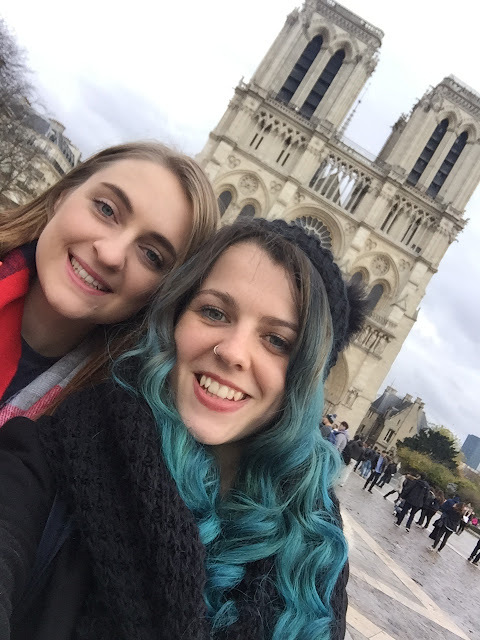 If you follow me on twitter you'll know last week I went to Paris for a few days with my friend Abbey. We were staying in Disneyland but decided we wanted to see some actual Paris too, our original plan was to see Paris our last day as we were so excited to get into the parks but we started panicking about the airport and changed to the first. Looking online there's loads of sites talking about travel around paris but no where really spells it out easily or tells you how to navigate the silly stations so we were pretty apprehensive about navigating the rail system when we barely know French. However we were successful and it was no where near as bad as expected. We literally did a very quick trip into Paris probably like 4 hours if you count the train journey from central Paris to Disney. We got the RER from CDG to Notre-Dame which was super straight forward, I loved that when you get out of the station you instantly see Notre-Dame and all it's beauty. We didn't have time to go in but on my next trip to Paris I plan on it because it's just so pretty on the outside I need to see the rest. After a few photos and a little wander around the outside we popped back underground to go find our way to the Eiffel Tower. A thing to note about the French rail system is that the final destinations are displayed on signs so you really need to keep a rail map handy. We found ourselves on the wrong platform and unsure how to get to the other side but we figured it out in time to catch the right train. Coming out at the Eiffel Tower station is where we got confused, you may find it hard to believe but we thought we were lost cause oddly enough we couldn't see the giant metal tower haha. Apparently its around the corner from the station. Personally I thought the tower was slightly underwhelming I mean it was great to see in real life but once you're there, there isn't really much to see or do unless you go up it. We then did a little wander to Bir Hakeim which wasn't too hard to find and got a metro to another station and then the train to Chessy so we could get to Disney. Even though we barely saw any of actual Paris I feel like I really got to experience some of the actual Parisian culture. On one train someone was playing an accordion and there were so many little things to look at like architecture of the standard buildings and just the people themselves wandering about. I feel like a few hours was enough time to have a little wander and see 2 of the main attractions in Paris. The trains are simple enough to navigate if you want to do Paris without a guide. I have 2 more Paris related posts coming up over the next week, both dedicated to Disney and I really cannot wait to share them with you.